I did a reader survey recently and you asked for more low-cost options, so today I am showing you a very budget friendly option for chairs. Here is how the room was before. I do love the chairs, but I got reports from family members that they are were comfortable. Since this is where my daughter and her caregiver watch TV, and take their meals, I decided it was time they got an upgrade. So I found these darling chairs at Kohls. This is the Claire chair. You can more Kohls chairs HERE. I selected the gray lattice. Now the chairs are normally $199, but they are $119.99 at the time of this writing. That is an amazing price. They are generously sized at 33.9”H x 20.9”W x 27.2”D, but still small enough to fit in the room. Since the space is small I didn’t want arm chairs, since they wouldn’t fit. I thought the gray would work well with the current bedding. And considering that I change things out a lot, I thought it would probably go with something new too. It’s a simple pattern, so it is going to go with more things than a complex pattern would. Kohls has lots of affordable furniture options for your home. Here’s a link to Kohls Furniture. Yes there are other patterns in the room, but the more simple the pattern, the easier it is to mix patterns. Note all of the patterns are just two colors per fabric. I removed the basket at the end of the bed. 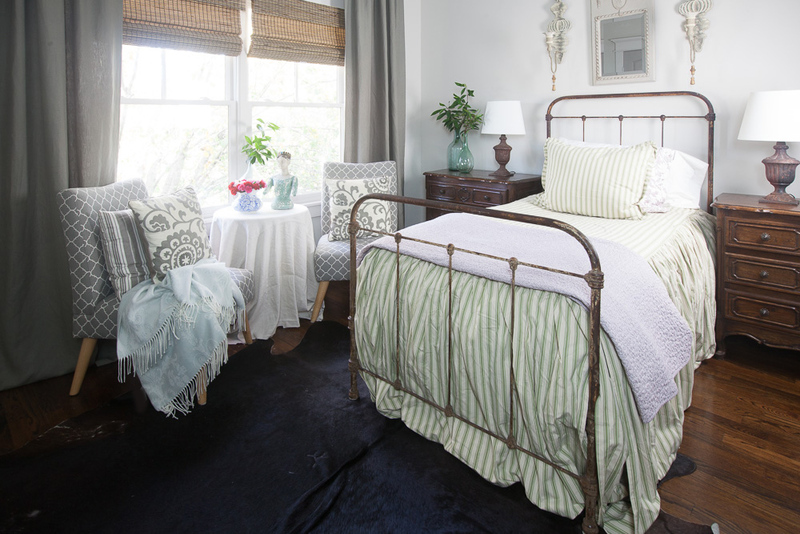 I do love the look of a bench or basket at the end of the bed, but with the chairs, I felt the room was too full. It feels a lot more open now without the basket. I like it! The other thing I want to note about the room is that the chairs are contemporary in a very traditional room. Does that work? I think so. 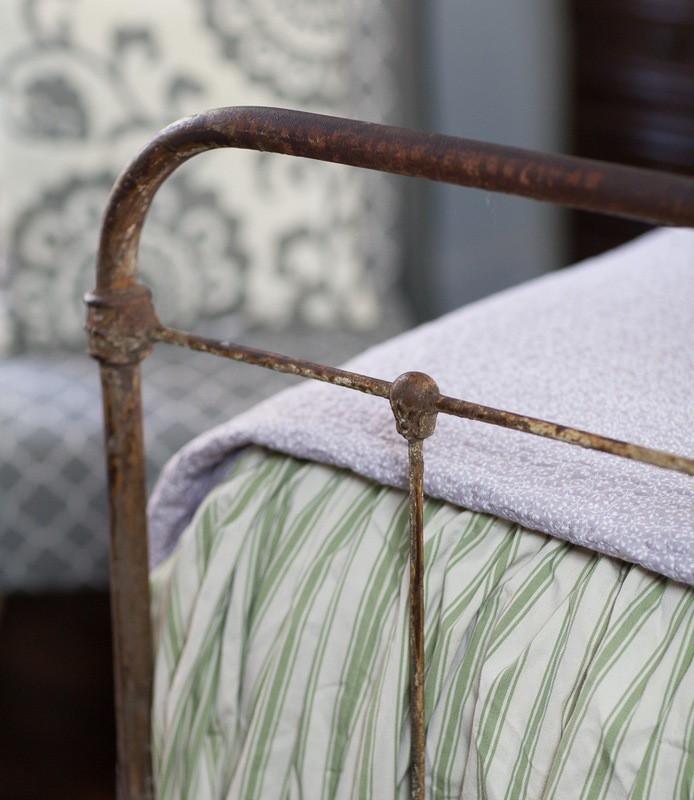 Many people ask how they can add a few elements of farmhouse French style to their home without replacing everything. This is one of the ways. 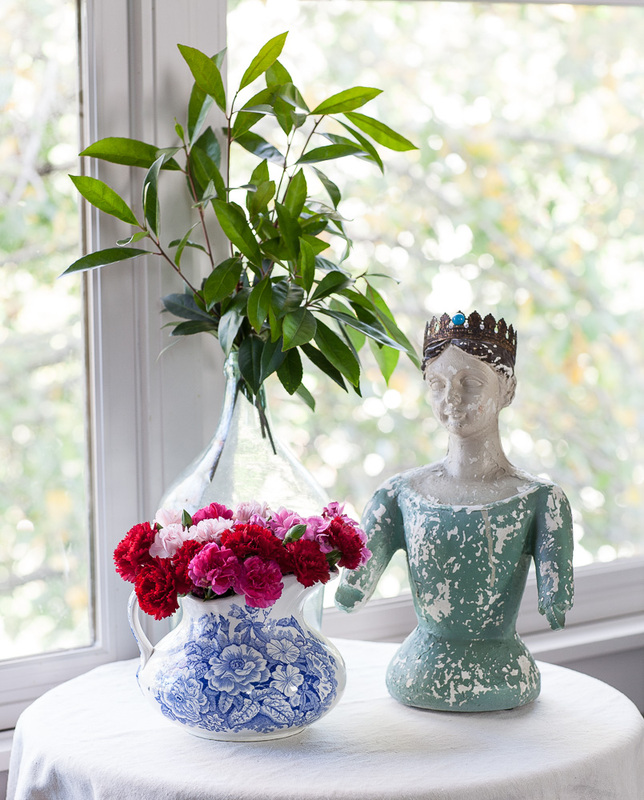 Just incorporate something in the room with your new style. Make sure it fits as far as size and color, but see if it looks like it fits in. Keep in mind my daughter is 23, so I definitely want it to look age appropriate for her. 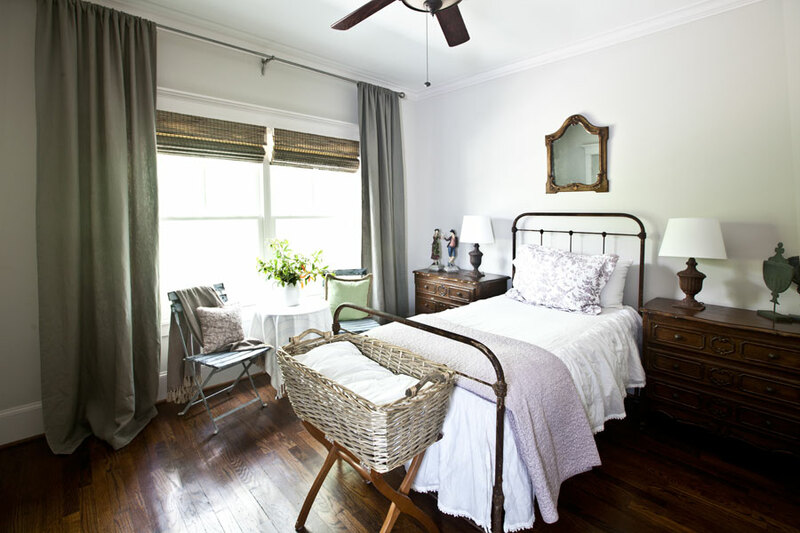 I think the room looks updated with the chairs, but still very farmhouse French and inviting. I like the detail on the chairs too. Very neat seams. I had the grey pillows in my closet, so that didn’t require a trip to the store. Good news, no need to get dressed! Here is what you need to know if you buy this chair. It comes in a compact box, which helps to keep shipping costs down for you. That means you do have some minor assembly. I attached the legs (super easy) and I put the back on the seat. This required two people to get everything lined up, but we got it done. Great little chairs. We bought similar ones in a solid color for my daughters apartment. They work in all different places from dining, extra seating in living area, bedroom. The sitting area in front of the windows is lovely. I am going to try recreating that in my master bedroom! I love the bedspread. Where did it come from? The chairs are a perfect size for the room. Great price!! What do you call the antique statue or bustbshown on the table next to the chairs. I have been looking to find one but I do not know what word to use to search. That’s a Santos. I had them in my shop, but sold out awhile back. Anita, those chairs look great in her room, and I bet she likes the change. I love the pillows too, but I know they’ll get tossed when they sit in them. I don’t want you to get dressed, so stay seated and find some cute green toile or ticking online ( or go through your fabric stash) and cover a couple small boudoir pillows that can stay put! Seriously, it looks fab and I know she’s liking the “grown up” look. Would these work for a dining room table? They are very pretty and I’m looking for new dining room chairs. Jeanine, you would need to check your table height and the height of these chairs. I think they would work if the heights worked out. 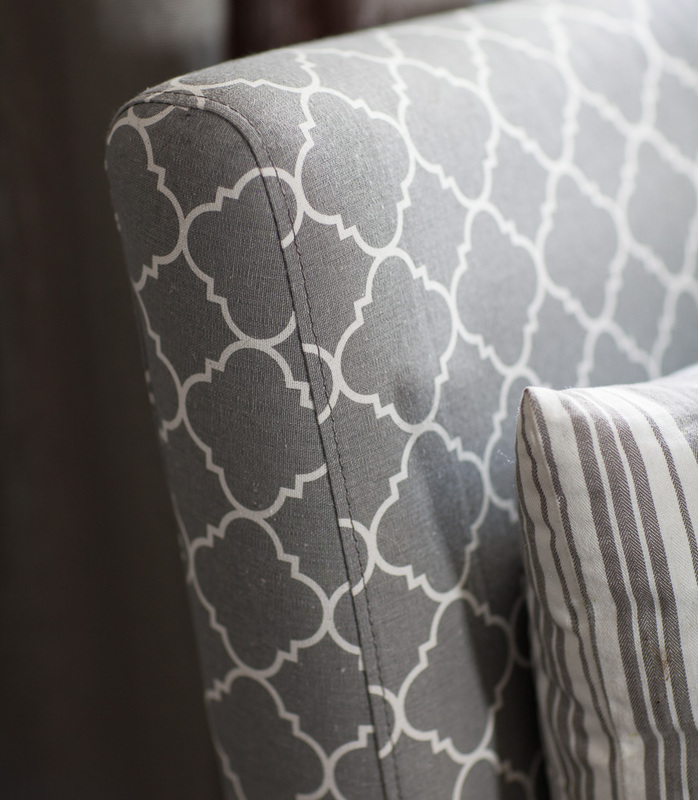 I have 2 almost like these in a black and white print…really love them…small but comfortable…love your gray ones, too…. I love everything about this room. I really fell for the santos doll bust. 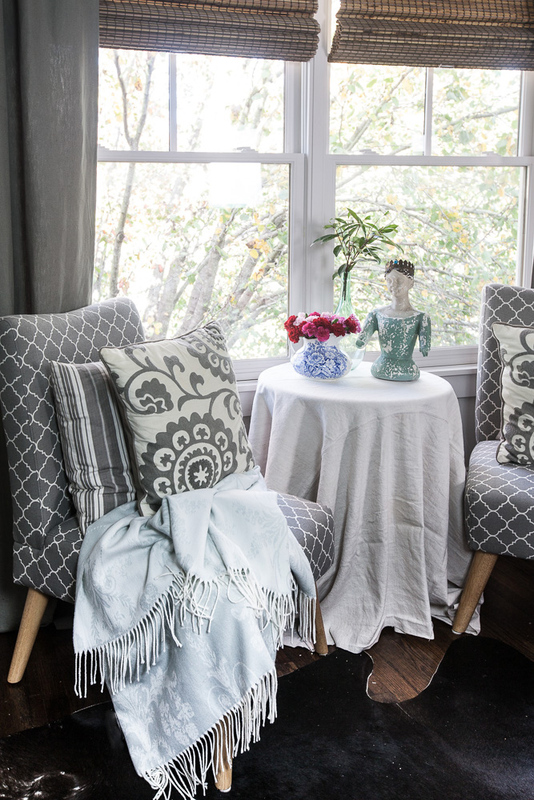 I love small chairs like these for bedrooms or home offices! The chairs before were pretty but these cars perfect!!! You, as usual, have great taste!!! Anita, the new chairs look lovely in your daughter’s room! Love that spot by the window — beautiful! I totally think the chairs are appropriate in this room–and very French. The French people have not stopped evolving their style but live with many different ones representative of the times their families have lived in. It is awesome that you thought these chairs would work for your daughter! You are following a French tradition! Those chairs look great in her and room! As usual sooo pretty. Thanks for the inspiration. love the chairs, pattern is beautiful, also the chipped lady statue with crown. The change is suttle and simple…..
Looks very nice and I did’nt know Kohl’s carry furniture–new place to check out for decor….